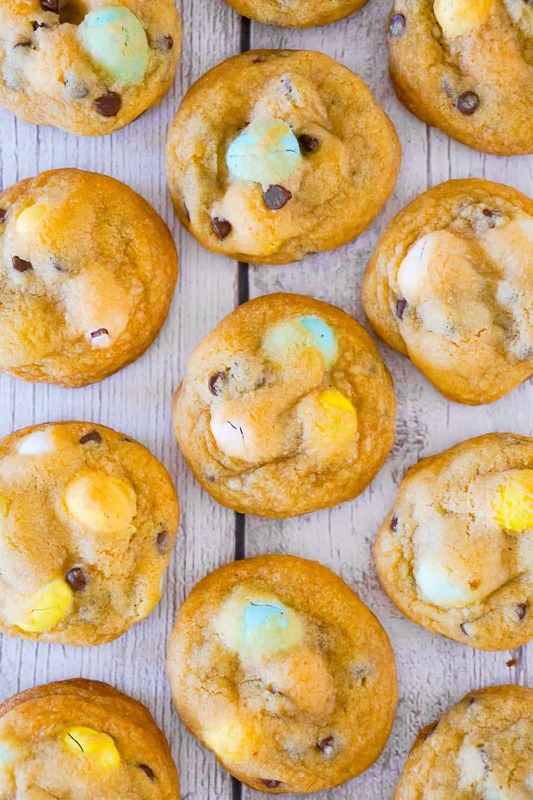 Easter Cookies are delicious chocolate chip cookies loaded with milk chocolate and cookies and cream Hershey’s Eggies. 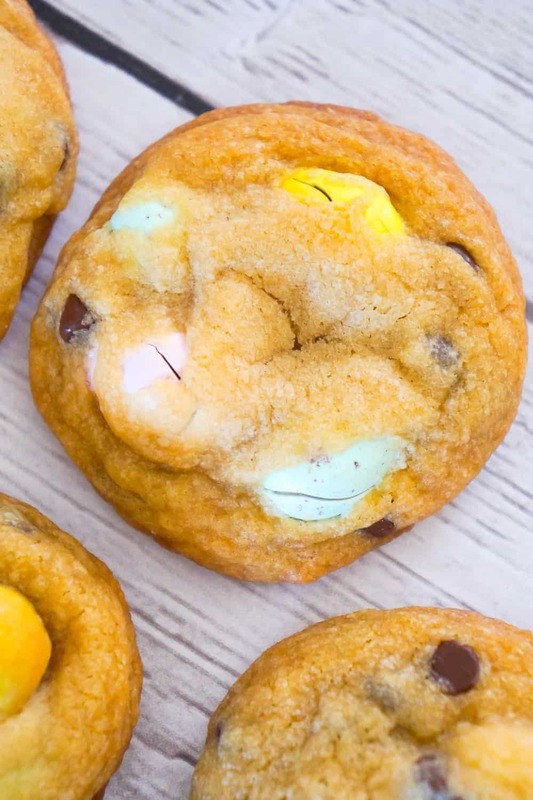 These chewy chocolate chip cookies with mini eggs are made with butter flavoured Crisco. To make these Easter cookies, I started by dumping some Crisco, brown sugar and granulated sugar into a large mixing bowl. Then I added an egg, milk and vanilla extract to the bowl. I continued mixing with the electric mixer until smooth. 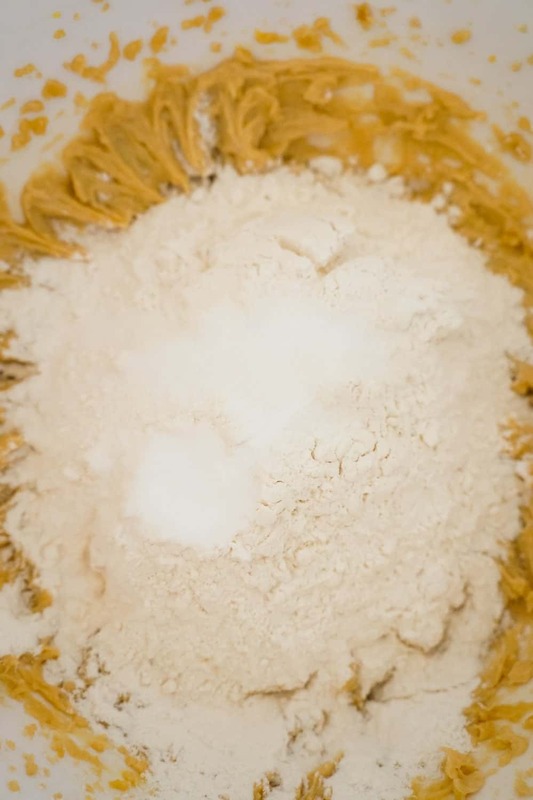 I added some all purpose flour, salt and baking soda to the bowl and mixer with the electric mixer until all the ingredients were fully combined. Then I added some mini chocolate chips and Hershey’s Eggies to the bowl. I used a mixture of milk chocolate Eggies and Cookies ‘n’ Creme Eggies. 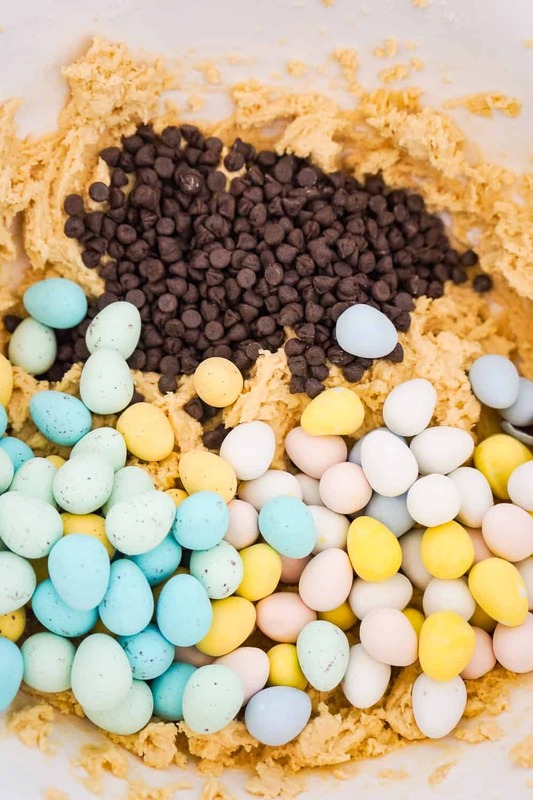 I used a rubber spatula to stir the chocolate chips and mini eggs into the cookie dough. Then I rolled the cookie dough into balls approximately an inch and a half in diameter and place them on a non stick cookie sheet. I baked the cookies until they were starting to brown around the edges. I allowed the cookies to cool on the pan for a few minutes before using a spatula to transfer them to some parchment paper on the counter to finish cooling off. These pretty spring themed cookies are perfect for your Easter dessert table. 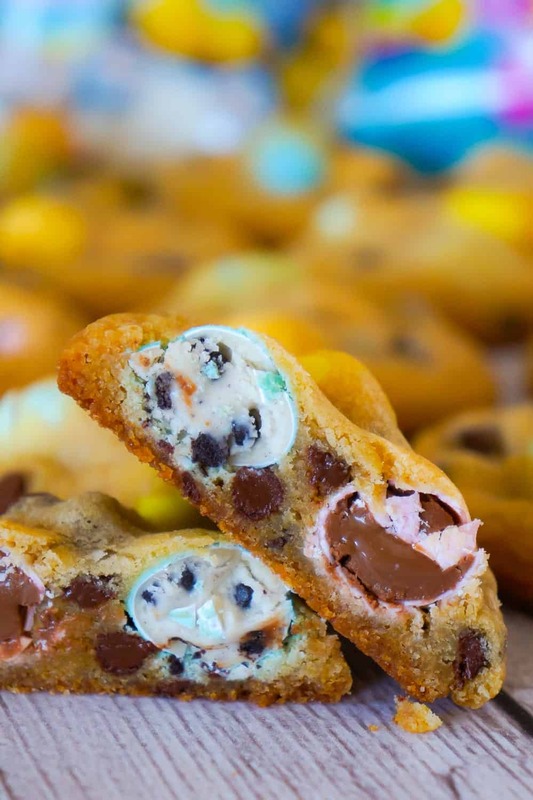 If you are looking for an easy and delicious Easter treat recipe, then you need to try these Easter Cookies. Another easy spring themed treat. 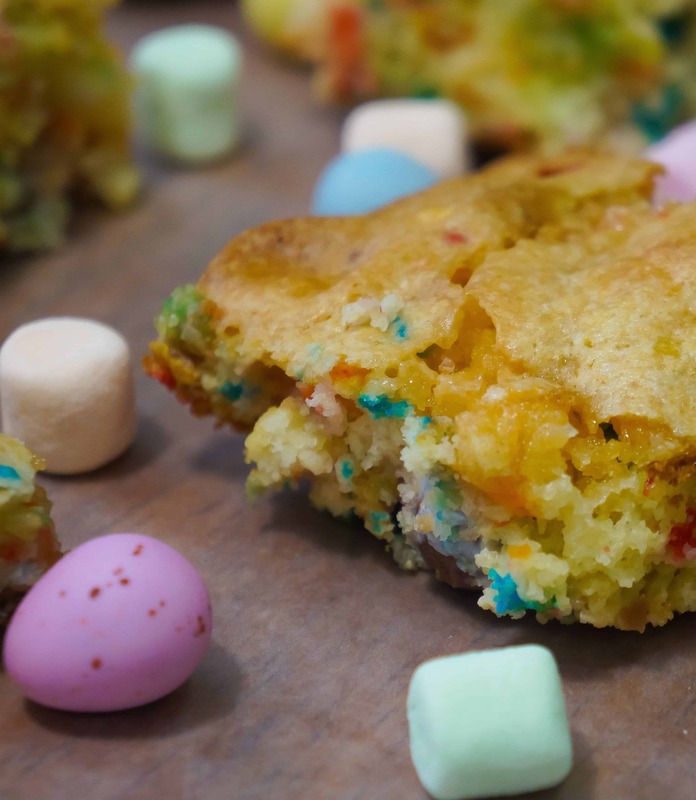 Check out these Springtime Funfetti Cake Mix Cookie Bars! Another delicious cookie recipe. 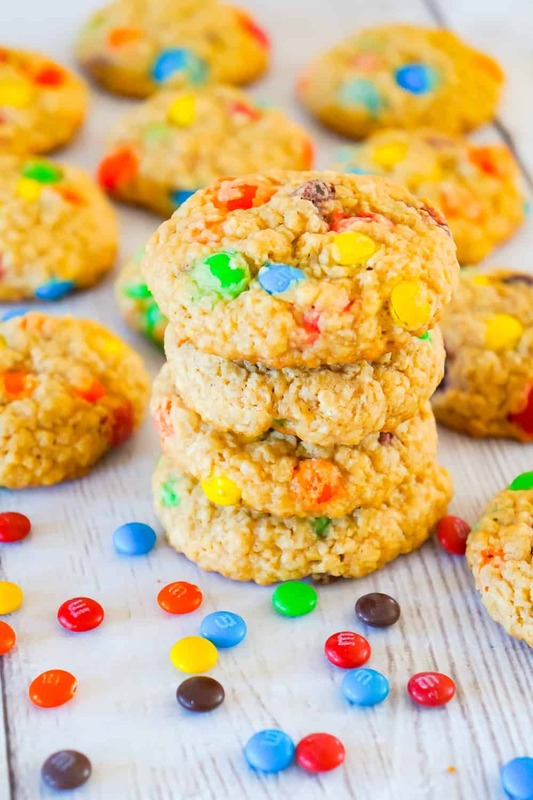 Check out these Monster Cookies! 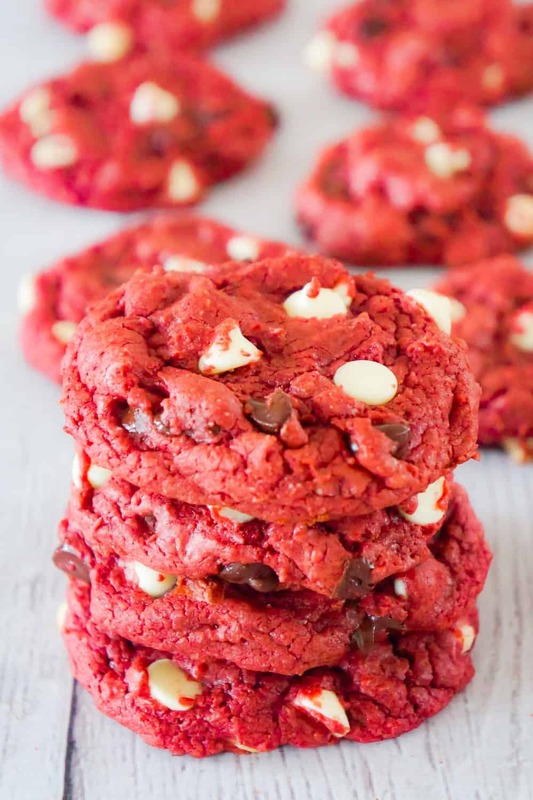 Be sure to also check out these Red Velvet Cake Mix Cookies! 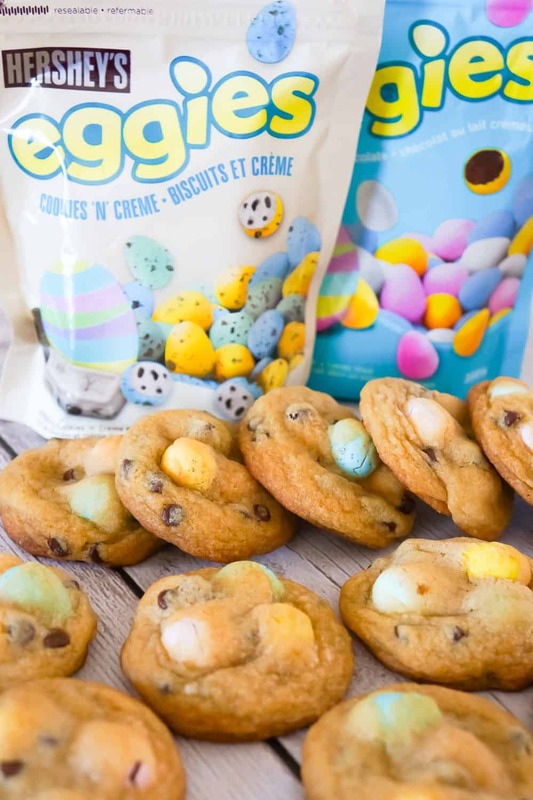 Easter Cookies are delicious chocolate chip cookies loaded with milk chocolate and cookies and cream Hershey's Eggies. 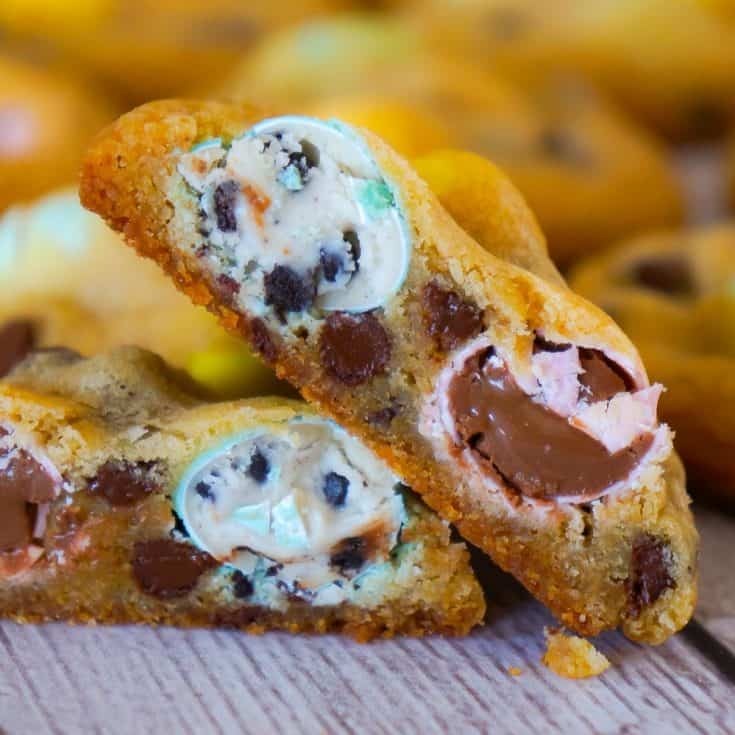 These chewy chocolate chip cookies with mini eggs are made with butter flavoured Crisco. 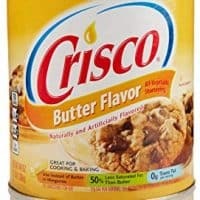 Dump Crisco, brown sugar and granulated sugar into a large mixing bowl. 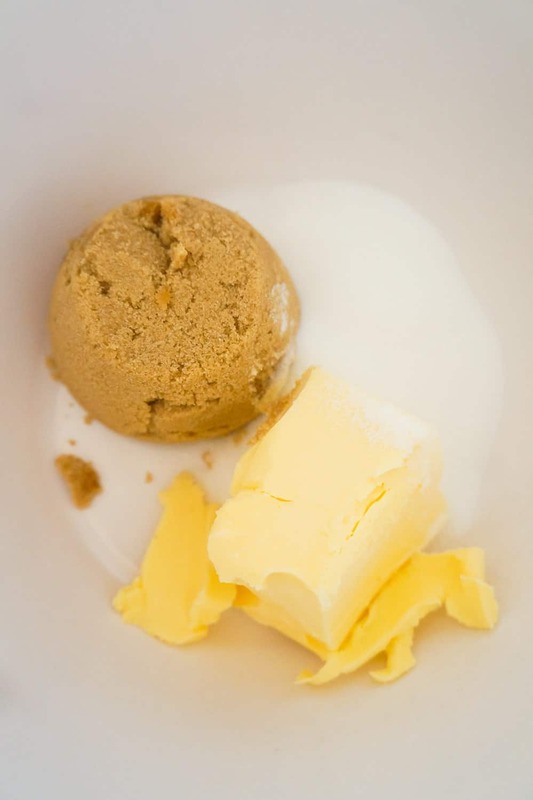 Cream together with an electric mixer until no large lumps remain. Add egg, milk and vanilla extract to bowl. Continue mixing with electric mixer until smooth. Add all purpose flour, salt and baking soda. Continue mixing until all ingredients are fully combined. Add mini chocolate chips and Hershey's Eggies to the bowl. 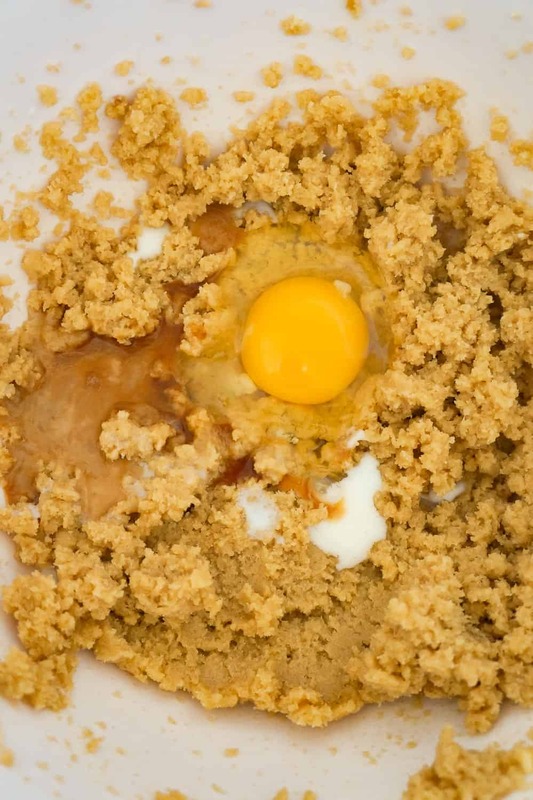 Use a rubber spatula to stir them into the cookie dough. 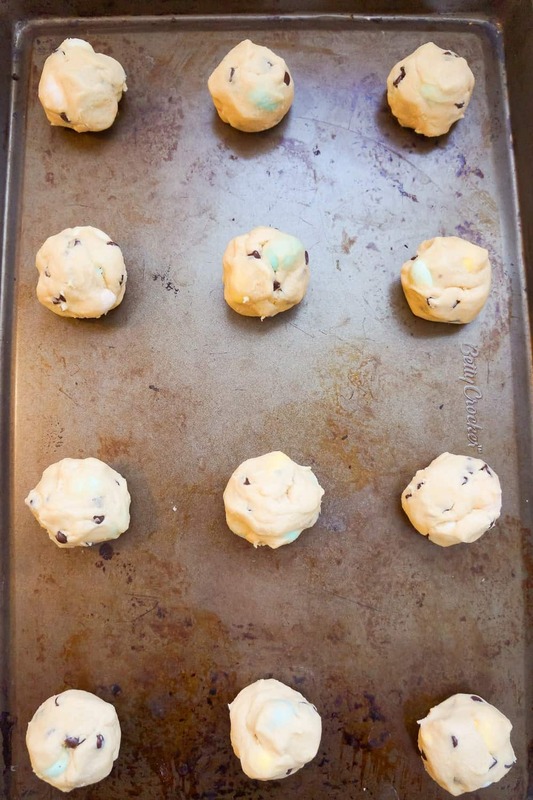 Roll the cookie dough into balls approximately an inch and a half in diameter and place them on a non stick baking sheet. Leave at least two inches between the balls. Bake the cookies until they are starting to brown around the edges. 9-11 minutes. Allow the cookies to cool on the pan for a few minutes before using a spatula to transfer them to some parchment paper on the counter to finish cooling off.